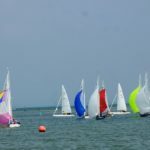 A bit earlier in the month than normal for the Valentine Trophy, however the annual Match Racing Championships had taken the weekend slot in a fortnight’s time. 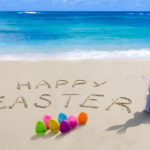 And what a difference 24 hours makes; Saturday overcast and virtually no wind; Sunday lovely and sunny with a cold Easterly F5 breeze. Mind you it did not seem to phase the Downer family who took the top three places. 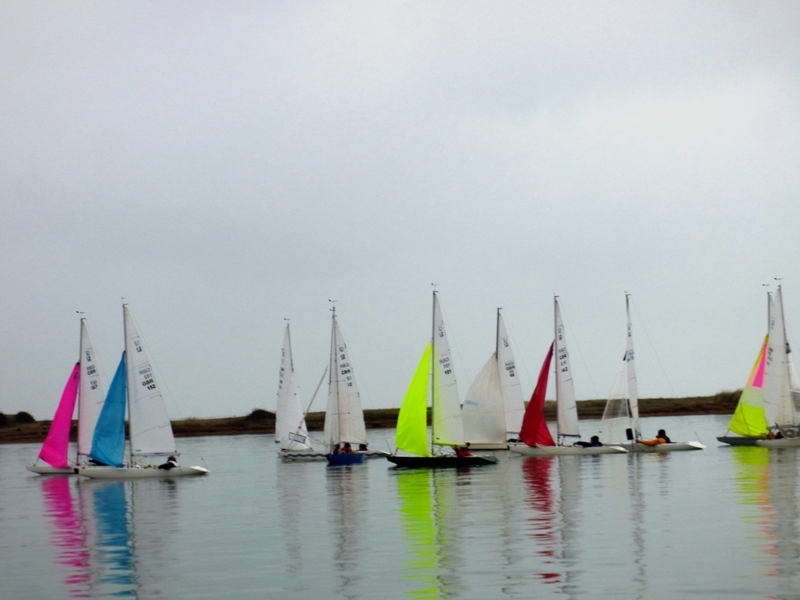 With 16 boats out on Saturday late morning everyone was hoping that the breeze would kick in as forecast, however sadly it was not to be. After over an hour’s postponement (during which time the Class Captain (Mark) and Class Commodore (Bruce) “inspected the fleet”) and with a ESE breeze looking as if it might build enough to get a couple of races in, the in-harbour course was re-set and everyone got away to a clean start. Progress was very slow even for the normal race leaders; Steve Warren-Smith was first to reach the windward mark with David Russell-Jones a couple of boat lengths behind. On the very slow run to the leeward gate, David managed to catch the zephyrs better than Steve and with the race shortened to one round, held onto his narrow lead as he beat back to the line. Philip Russell and Alastair Speare-Cole nearly caught them on the run, but had to be satisfied with third & fourth. 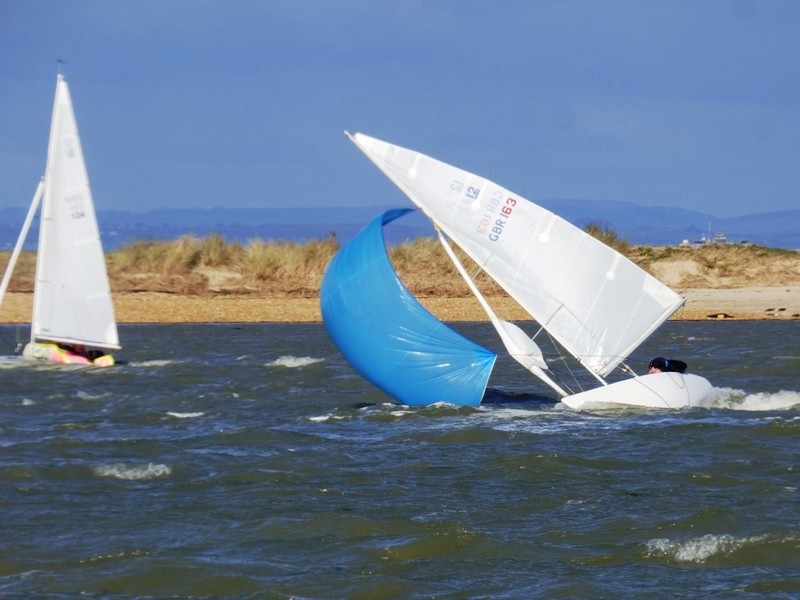 With such a short course and the fickle breeze, there were a number of other close finishes (inches separated Richard Ambler, John Raymond and Mark Downer) and Sam Prime & Mike Toogood tied for twelfth place. With the outlook for further racing looking distinctly unpromising, racing for the rest of the day was abandoned and everyone “praddled” their way back to the Illusion Quay. Although five of the previous day’s entries had other commitments, Justin Biddle & George Downer joined the fray which meant that there were still twelve boats on the line for the first couple of races. 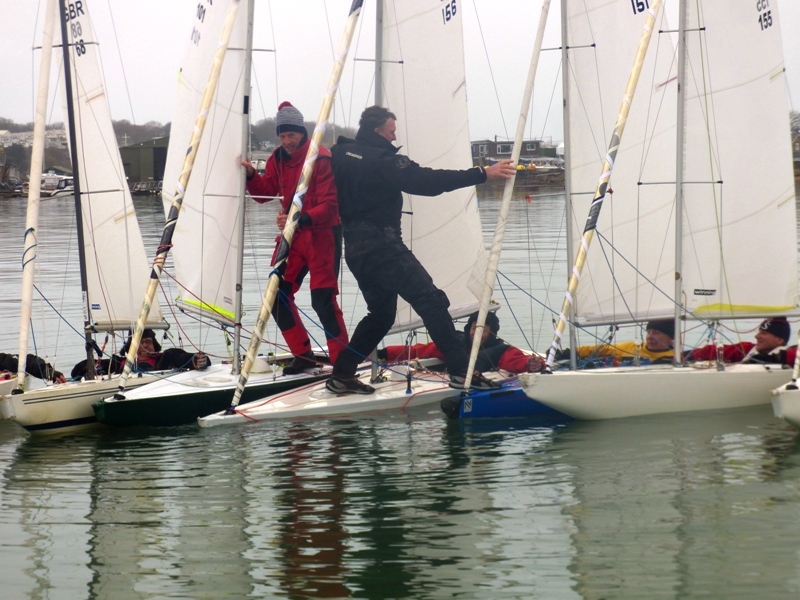 The first race got away cleanly in the cold and gusting 17 knot breeze. Mark Downer, reveling in the stronger winds, was first round the windward mark; Julia Bailey was next and despite best efforts was unable to reel Mark in. Bill Daniels was initially third but as the two round race developed found himself dropping down the fleet and by the end was seventh. Jo Downer and Justin Biddle were neck and neck for most of the race and less than a second separated them as they finished just ahead of Julia. 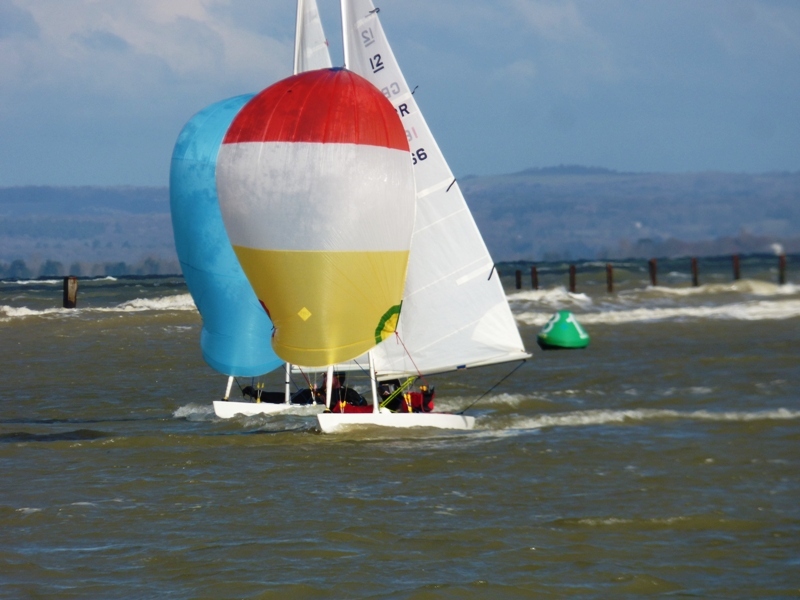 After a short postponement when it was spotted that the Committee Boat had dragged her anchor a bit and the pin end of the line needed adjusting, the start of the second race got away cleanly. George Downer’s well timed pin end start on port tack put him at the front of the fleet on the beat to the windward mark, however by the time they started the run to the leeward gate, it was his father’s pink spinnaker that was yet again first up. After an excellent first leg, it was good to see Mike Toogood’s red spinnaker in the leading group, sadly by the finish after two rounds he was down to fifth as father, son and mother Downer took the first three places; Justin was fourth again mere inches behind Jo. Another good start for the third race of the day with Julia Bailey spot on the button. With the St Helens shore clearly the best choice, everyone remained on starboard as they headed that way. Mark’s pink spinnaker was again first to fly after clearing the windward spreader; next up was Julia Bailey’s pink one and a bit later Jo’s multi-coloured one. Despite a challenge from Justin who finished in fourth, there was no change in the front three as they completed the two round race. 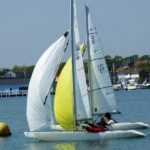 Although the sun was shining and it was reasonably warm out of the wind, it certainly wasn’t out on the water so it was decided to have a final race with the finish after two rounds at the windward mark. 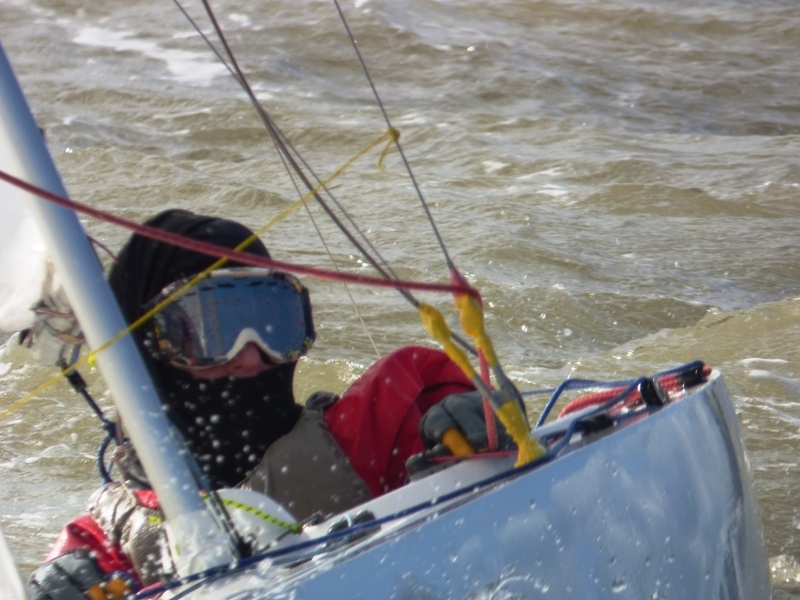 With the fleet down to seven starters as the cold and windy conditions took their toll, the start saw Mark OCS and having to return. This put him to the back of the fleet, however after one round he had already overtaken half the fleet and was back in his usual position at the front by the time he had rounded the leeward gate for the final time. Jo meanwhile was second and Julia was third however the latter subsequently retired with a genoa problem which left George in third place and Justin in fourth. 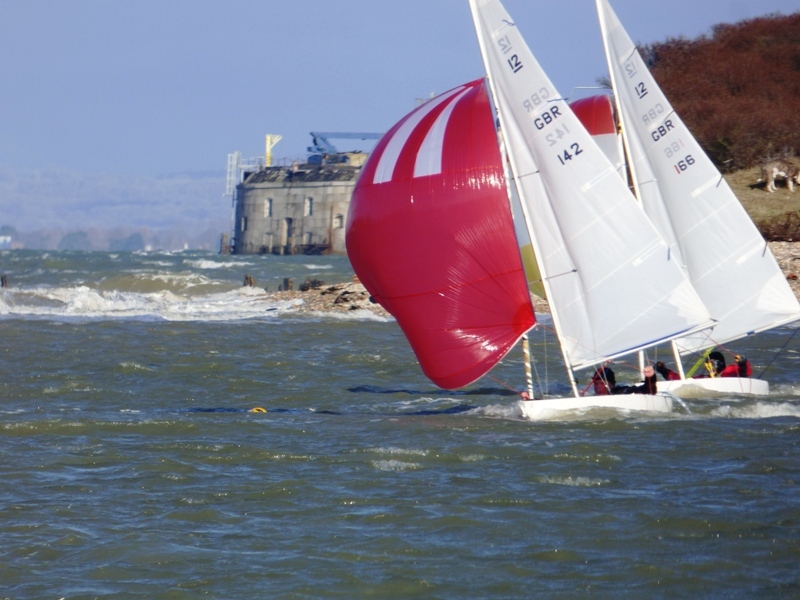 A challenging weekend’s sailing. 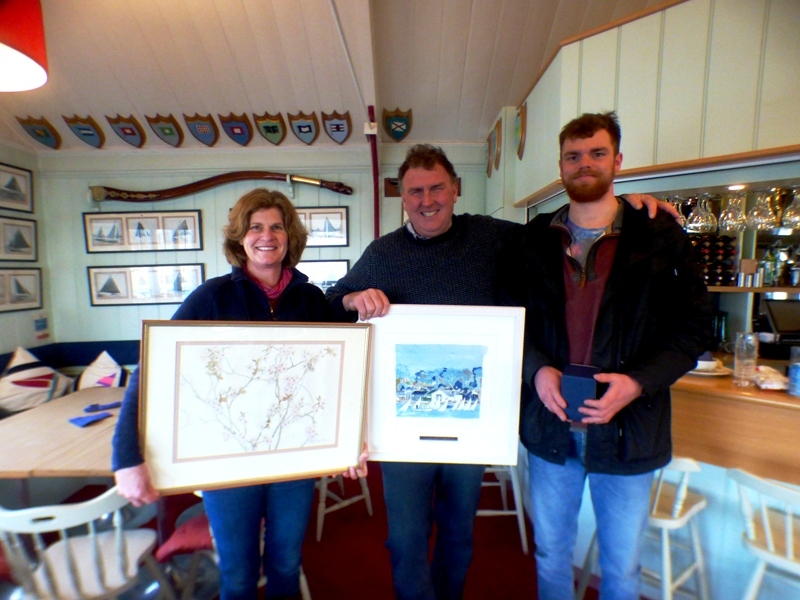 Congratulations to Mark who was the overall winner by a considerable margin; also to Jo who was second and won the first lady helm trophy and to George who just pipped Justin and was third.